The starting structure of the green fluorescent protein with the ligand molecule highlighted with a sticks representation. This tutorial demonstrates how you would go about preparing a system with a modified amino acid in order to run a simulation using the AMBER molecular dynamics engines. Note that this tutorial differs from other examples that parametrize a small organic compound because the custom residue is part of a polymer chain, so there are additional complications involved with deriving the charges and preparing the files to appropriately insert the custom residue into the peptide chain. We assume that you are already familiar with running basic simulations of systems that contain only standard residues (familiarity with the antechamber Sustiva tutorial is suggested as well), so that the focus here will be on the steps needed to parametrize a custom residue. The tutorial will, however, follow through on the full workflow of a molecular dynamics investigation of GFP. 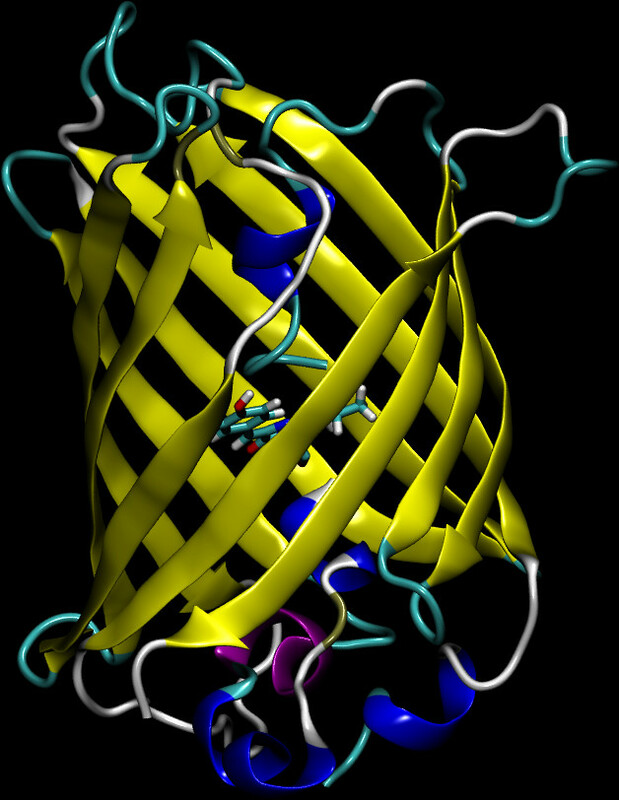 We start with the PDB file 1EMA.pdb, which contains the GFP with a fluorophore named CRO. So go ahead and download the PDB file from the RCSB website (or click here to download a copy). You can see the CRO residue in line 896 of the PDB file as residue 66 (residues 65 and 67 joined with residue 66 in the creation of the fluorophore, as described in the header of the PDB file). Pay careful attention to the output from pdb4amber so that you understand what has been done. The resulting PDB file should now contain all of the hydrogens for each of the residues (and there are no disulfide bonds, but if there were pdb4amber would have added them correctly for you). After you run pdb4amber, you need to modify the resulting gfp.pdb file to convert the MSE residues (selenomethionine) into the more standard MET (we intend to simulate the wild-type variant, not the mutated version needed to ensure proper crystallization). You can do this with sed or your favorite editor by doing a global replace of MSE with MET. Furthermore, you need to convert the selenium atom into the sulfur atom (named SD) and change the element from SE to S. You are encouraged to run this command yourself, but our copy of gfp.pdb can be downloaded here for comparison. So we know from the header of 1EMA.pdb that CRO is not a standard residue (it is, in fact, a cyclization of three amino acids). As a result, the standard Amber residue libraries do not contain atom types or charges for this residue. These are needed for any molecular mechanical simulation. This section will focus on deriving charges and determining the atom types of the CRO residue. We will use antechamber to derive charges using the bcc charge scheme that you will be familiar with if you ran the Sustiva tutorial mentioned in the introduction above. Note that this choice is not unique, nor necessarily optimal for every application. Other tools, such as R.E.D. Tools provide a more rigorous and reproducible set of charges, but antechamber will suffice for our needs in this tutorial. If you wish to use R.E.D., they have a number of tutorials that you can use to generate the charges and atom types, after which you can rejoin this tutorial in Section 4. Among many other files, you will see cro.ac, which vaguely resembles a PDB file, but contains a listing of bonds as well as partial atomic charges and atom types. Note that antechamber is mostly set up to use gaff atom types, so it occasionally makes a mistake with the Amber atom types. In this example, we will fix up the beginning N atom, which should have the same type as an amide nitrogen (N). You can simply change the atom type NT to N by hand. (Or for practice, try to use sed, awk, or perl to change it.) You can download a copy of cro.ac that we created to compare to yours. We now have the partial atomic charges and atom types for the atoms within the antechamber molecule file. The next section will discuss how to create the residue library file and prepare it for use with LEaP. NOTE: you would generally use antechamber to create a mol2 file to be read into LEaP. However, since we need to process the resulting file with prepgen later, we need to use the ac format which is all that prepgen supports. The "CRO" component we downloaded from the PDB is a complete molecule with all of its hydrogen atoms included, which is what antechamber (or any quantum mechanical program) needs in order to compute charges. But we need to strip off the atoms at the beginning and the end to make an "amino acid"-like residue that is ready to be connected to other amino acids at its N- and C-termini. The HEAD_NAME and TAIL_NAME lines identify the atoms that will connect to the previous and following amino acids, respectively. The MAIN_CHAIN lines list the atoms along the chain that connect the head and the tail atoms. The OMIT_NAME lines list the atoms in the CRO residue that should be removed from the final structure, as they are not present in the intact protein. The PRE_HEAD_TYPE and POST_TAIL_TYPE lines let prepgen know what atom types in the surrounding protein will be used for the covalent connection. (Remember that prepgen can be used for polymers other than just proteins and peptides.) The CHARGE line gives the total charge on the residue; prepgen will ensure that the charges of the "omitted" atoms are redistributed among the remaining atoms so that the total charge is correct (i.e., 0 in this case). After you run this command, you should have a cro.prepin file that contains the definition of the CRO residue (you can download our copy of the file here for comparison). At this point, we have our residue library containing the charges for the atoms in our modified amino acid . We next need to check that the covalent parameters (bonds, angles, and dihedrals) that will be needed are available. The parmchk2 program figures out what parameters will be needed and checks to see if they are in the standard files. If not, it tries to make educated guesses, and puts these new parameters into a file we are calling "frcmod.cro" here. Here we specify the parm10.dat file because it is the main parameter database for the force field we plan to use, ff14SB (this information can be found in the leaprc file for the force field you plan to use). If we omit this flag, then parmchk2 will match to parameters in the gaff database, which is not what we wanted when we chose the amber atom types when we ran antechamber. We also asked for all parameters to be printed (even the ones with perfect matches in parm10.dat), for reasons that will be apparent soon. After this step is done, look at frcmod.cro (you can compare to our copy of frcmod.cro). You should immediately see problems with lines containing parameters of 0's labeled ATTN, need revision. This means that parmchk2 could not find suitably similar parameters in the parm10.dat database. There are also numerous other parameters that were selected having a high penalty (which indicates a poor fit as determined by parmchk2). At this point, we have two frcmod files; one with the parameters extracted from the Amber parameter database (frcmod1.cro, which you can download here to compare to your file) and one with the parameters extracted by matching to gaff atom types (frcmod2.cro, which you can download here to compare to your file). Between these two files, we have all of the parameters that we need. If you want to, you can combine these into a single frcmod file by extracting the 7 missing parameters (and any additional parameters with high penalties) from frcmod2.cro and adding them to frcmod1.cro. However, if you are careful to follow the order in which these parameters are loaded in the next section, this step is not needed. Let's proceed on to our step of creating the prmtop and inpcrd files. As always, the parameters generated here--particularly the ones supplied by gaff, should be viewed as a starting point that should be validated against available experimental or high-level QM data. For the purposes of this tutorial, we will simply proceed with what we have generated here. We now have all of the files we need to create the topology and coordinate files for sander or pmemd! We just need to load these files into LEaP to create these files. If you used R.E.D. or some other tool to do the charge derivation and atom typing, welcome back. For this example, we choose the ff14SB force field and the igb=8 implicit solvent model, as described in the Amber reference manual. Setting the default PBRadii to the "mbondi3" set is a part of specifying this force field. After this step, you should have your finished topology and coordinate files, and you are ready to run simulations! You can download the versions we created here to compare with your own. On to section 5! Since the purpose of this tutorial was to walk through parametrizing a modified polymer "link", this section will be brief. In your own project, you are of course free to choose an explicit solvent model and a more careful minimization, heating, and equilibration routine than what we use here (perhaps utilizing positional restraints to prevent the structure from distorting). As always, we suggest that you visualize the resulting structure (min1.rst7) to make sure that nothing obviously bad happened, as well as the output file to make sure that everything looks OK (e.g., that the structure remained intact and that the total energy and maximum gradient steadily decreased during the minimization). The output files we created can be downloaded as part of a tarball containing most of the files generated during the calculations at the end of this section. The input file we use here for heating is shown below. We will name this file heat.in, and it will vary the target temperature linearly over the course of 200 ps from 10 K to 300 K.
We have successfully heated up our structure! Now we are ready for our production simulation. Note that what many people call "equilibration" is really just a portion of the production simulation that you neglect during analysis, either because you used restraints to stabilize the structure or you are letting the system migrate toward an equilibrium configuration. For the purposes of this tutorial, we will not distinguish between those two phases, as we would use the same input for both. And that's it! Of course, you still need to analyze your simulation in order to test whatever hypothesis drove you to run the calculation in the first place. But you now know how to parametrize a new, modified monomeric unit within a polymer chain (such as a modified nucleotide or amino acid). The strategy employed here can be applied to any polymeric unit you wish to use.